Dr. William M. Scholl was the third generation of a German family that immigrated to the United States in 1852. Born on his father&apos;s dairy farm in LaPorte, Indiana, he became a true innovator in the foot care industry. His main theory was that if your feet hurt, then the rest of your body hurts, so he dedicated his life to developing and providing a diversity of foot care products to people around the world. William loved to work with leather instead of performing his chores on the farm. At age 15, he made his own waxed thread and mended a horse harness using 132,000 stitches. On his way to Chicago, he had a job at a shoe shop in Michigan City as a shoemaker&apos;s apprentice for $3 a week. At about the age of 16, he was at Armour, a small village situated on the northwest shore of Cedar Lake, where his grandfather, Peter Scholl, Sr., resided. It was here, in the Lauerman general store, where young William continued learning to make shoes, using his grandfather&apos;s cobbler tools which are now on display at the Red Cedars Museum. He also briefly worked in Hammond. Once in Chicago, he began working at Ruppert&apos;s Shoe Store on Madison Street for $8 a week. He was 17 years old at the time. As he continued to work at Ruppert&apos;s, he began attending the Illinois Medical College, now Loyola University. By 1904, he earned his medical degree. Soon after, he began his business as a producer of orthopedic foot appliances known as Dr. Scholl&apos;s. In 1905, he was granted a patent for the Tri-Spring device and a few months later he filed patents on the Foot-Easer and another in-step arch support. Dr. Scholl went on to invent more than 1,000 foot aids. Then in 1910, his brother Frank joined him in the business and Scholl Manufacturing Company, Ltd., in London, England, was established. By 1928, his first retail store was opened. He would serve as the company&apos;s president and chief executive officer until March, 1968. Dr. Scholl also had a great concern for education and the improvement of the world. In 1912, he founded the Illinois College of Chiropody and Orthopedics, which became the Dr. William M. Scholl College of Podiatric Medicine. It is now part of the Rosalind Franklin University of Medicine and Science of North Chicago. Later in 1947, he founded the Dr. Scholl Foundation, which provides financial assistance to organizations committed to improving our world. Interestingly enough, the Newberry Library&apos;s Center for Family and Community History in Chicago became the Dr. William M. Scholl Center for American History and Culture in 2008, which is supported by the Dr. Scholl Foundation. Although he is gone, Dr. William M. Scholl&apos;s foot care legacy continues to live on. 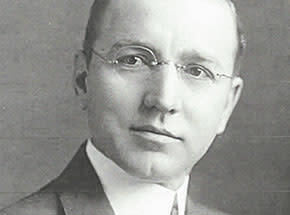 Dr. William M. Scholl was nominated by Scott Bocock, Cedar Lake Historical Association, Inc. He was cited for meritorious service on July 4, 1944, near Castellina, Italy. 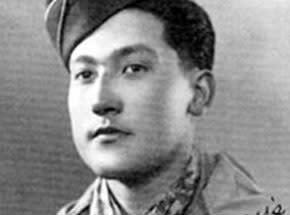 He was a member of Company G, all Nisei Japanese-American 442nd Regimental Combat Team attached to the 34th Infantry Division. In attacking a heavily defended hill, he made himself the constant target of enemy fire. He is one of 22 Medal of Honor recipients in his combat team, one of the most decorated U.S. units of all time. With those words on Christmas Eve 1968, Apollo 8 Commander Frank Borman ended the most viewed telecast in history up to that moment. 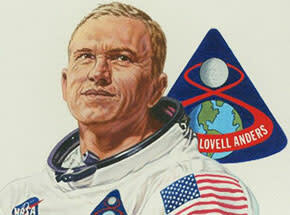 Borman had led his fellow astronauts, Jim Lovell and Bill Anders, on the first mission to take humans beyond Earth orbit and explore the Moon. For Frank Borman, the success of Apollo 8 proved to be one of many achievements in his distinguished career. Born on March 14, 1928, in Gary, Ind., he suffered from sinus and respiratory troubles, causing his family to move to Tucson, Ariz. while Frank was a small child. He decided he wanted to serve his country as a pilot, earning his bachelor&apos;s degree from U. S. Military Academy at West Point in 1950. He began his USAF career as a fighter pilot, 44th Fighter Bomber Squadron, Philippine Islands, 1951-1953, followed by teaching assignments at West Point and in the USAF Aerospace Pilot School. Along the way, he earned a Master of Science degree in aeronautical engineering from the California Institute of Technology in 1957. In 1962, Borman joined NASA as a member of the "New Nine" class of astronauts. He, his wife, Susan, and sons, Edwin and Frederick, joined the space fraternity in Houston, Texas. In December, 1965, he commanded Gemini 7, a 14-day flight to test human endurance for a future lunar voyage. After the tragic Apollo 1 fire, Borman led the Fire Investigation Board and the re-design of the Apollo spacecraft. Upon the completion of Apollo 7 in October, 1968, Borman and his Apollo 8 crew flew the first manned Saturn V rocket on that historic circumlunar journey in December. With that triumph, Colonel Borman retired from NASA and the USAF in 1970. Colonel Borman joined Eastern Airlines as a special advisor and rose to several leadership positions until named Eastern&apos;s president and CEO in 1975 and chairman in 1976. During his tenure, the airline enjoyed several years of profitability, followed by a period of losses and contentious relationships with its union. Colonel Borman retired from Eastern Airlines in 1986 and currently resides in Bighorn, Mont. Colonel Borman will be best remembered for his Apollo 8 flight, which provided one of the most famous photographs in human history: "Earthrise," showing our planet&apos;s beauty and fragility while hovering in the dark vastness of space. Frank Borman was nominated by Wil Davis, President/CEO, Gary Jet Center. The nomination was prepared by Stephen McShane, Curator, Calumet Regional Archives, Indiana University Northwest. Neil P. Ruzic (1931-2004) was a visionary, connector and pioneer in not just one, but four very different arenas. He published 250 articles, wrote 12 books and followed his passions, resulting in an amazing life. Ruzic combined science and journalism to promote "Interdisciplinary innovation" and impact public policy. He started Industrial Research & Oceanology Magazines in 1959, proving that magazines could be interactive, and was the first to use the "bingo card" response system, which transformed print media. Ruzic introduced the I-R 100 (now called R&D 100) considered the "Nobel Prize of Product Development," in which Chicago&apos;s Museum of Science and Industry annually recognizes the top 100 new products. In 1971, Neil wrote an article called "Wage Peace" detailing how we could transform our military-industrial complex from war and destruction to growth and construction. This prompted a serious response from the War College and elicited a tenfold response from readers. After President Kennedy proposed a moon voyage during his famous 1961 speech, it was Ruzic who wrote "The Case for Going to the Moon" in 1965 and sent it to every member of Congress, even opponents of the "moondoggle." Later, NASA tapped Ruzic to document the transfer of space technology to civilian life in "Spinoff" reports. "Technology transfer" became status quo. Also, Neil founded the National Space Society with Dr. Werhner von Braun (former director of the George C. Marshall Space Flight Center). Moreover, he holds the first U.S. patent for a device to be used exclusively on the moon (Lunar Cryostat). Island for Science: Neil had a vision of "interdisciplinary innovations" for food and energy production. He bought Little Stirrup Cay in the Bahamas, to become an "engine of technology." His group devised scientific strategies and profit-oriented market analyses described in the "Blueprint for an Island for Science; Shallow-Ocean Polyculture System." Well into construction, the Bahamian government denied permits. Neil reluctantly shifted gears and sold the island to a cruise line, which provides important jobs for the area. Racing for a Cure: In 1998, Ruzic was diagnosed with mantle-cell lymphoma, the deadliest cancer of the lymph system and was given two years to live. He took control by digging deep into biochemical and immunologic global research. Neil invested the proceeds from the sale of the island and started the Ruzic Research Foundation. He testified before Congress and got a substantive response, including the successful human genome project, strategically increased funding for university research, and advances in immunotherapy. He wrote "Racing for a Cure" to share his story. A decade later, molecular immune engineering (a stem cell technology) became an accepted therapy. He had unshakable faith in finding more humane and effective ways to fight cancer. He died in 2004, living four years longer than expected. Neil P. Ruzic earned journalism and science degrees from Northwestern University, and moved to Beverly Shores, Ind. where he was a reporter for the Michigan City News Dispatch. He served in the 3rd Armor Division in the Korean War. 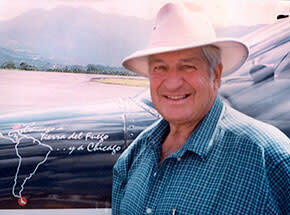 He also learned to fly and flew a single engine plane around the South American continent in 1997. Neil had many gifts, which keep on giving to all of us. Neil P. Ruzic was nominated by Maggi Spartz, Unity Foundation of LaPorte County.